Caste-like classifications exist in many cultures, although without the fine grades of taxonomy observed in India. India, the land of numerous customs and precepts defined along the lines of gender, religion, caste, class, ethnicity and language, sequentially brings about a relation of disparity through them. These distorted relationships collectively shape the identity of every person, through his or her associations with others and the social atmosphere. Individuality interplays with the gender of the individuals (masculine or feminine), declaring the dogma functioning in the societal milieu. A mainstream Hindu group who were against any change in traditions. In a socially segregated society, the rank and the status enjoyed by women mirror the social order. Indian culture is a ‘caste society.’ Caste, a qualified status, is a rigid system of imbalanced associations specified by birth, endogamy and associations through ceremonial sacraments. Caste divides society along the lines of jati (a birth-status cluster), hierarchy (order and rank) and interdependence (division of labor linked to hierarchy). Indigenous groups are politicized religious communities that mark social and cultural variances between groups of people. These communities identify their caste status through division by birth, endogamy and interdependence through ritual services. Public policy in modern India showcases affirmative action systems intended to diminish inequality that stems from a centuries-old caste constitution and history of incongruent treatment by gender. The Indian society is divided up into groups that are hierarchically interrelated, with some rendered higher status than others. Classical texts talk about four castes—priests, warriors, merchants, and servants—but administration censuses and anthropological surveys have identified hundreds in South Asia. Membership in one of these groups is dependent upon birth. Dalits are a group of people conventionally regarded as untouchable within the Hindu caste pecking order. Contemporary India is witnessing an unparalleled rise and spread of the Dalit development. According to a custom, in certain areas of Rajasthan, women are hired as professional mourners after the death of a male relative. These women are referred to as a ‘rudaali’ (roo-dah-lee), literally translated as a female weeper. What differ are the details that make the substance of human action and human conceptualization. The framework, within which concepts materialize and the contexts where they travel to, needs expression. Rudaalis in turn publicly express the grief of family members who are not permitted to display emotion due to social status. The ‘rudaalis’ make a scene crying out loud. The impact of their mourning also compels other people at the funeral to cry. Always dressed in black, they have to sit and cry, crying out loud, beating the ground beating their chests screaming and crying. They are professional tear shedders. They get the details of the dead person, his or her near and dear ones. Rudaali is one of those disreputable orthodox practices where bereavement was required expressions of unrestrained sentiments by rolling on ground along with songs in praise of the dead. 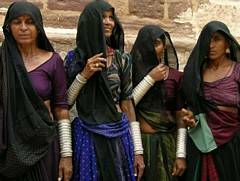 Mostly, women who live in grave poverty and belong to the lower castes are forced to turn out to be Rudaalis. The socio-cultural custom of hiring a rudaali throws light on the dialectical association between the upper caste and the lower caste in Rudaali. Hiring a rudaali is a status symbol and augments family pride. That the rudaali provides a funeral service in the face of upper caste women being incapable to declare their sorrow hits hard on the gender ideologies scheming obsequies among the caste. Caste defines the social status of women as pure or impure in the community. Through the gendering of death rituals, women mourners or rudaalis verge as complicated modes of amusement for the upper classes. Rudaali throws light on the agonizing experiences of Shanichari, a widow whose life has been disturbed by hardships. Through heartrending vignettes, Lajmi deplores the appalling life of Shanichari who ultimately becomes a rudaali, giving vent to her sorrows. Meaningfully, while most feminists were disparaging of the state downgrading its commitment to the poor and vulnerable, there were conflicting views. Feminism endeavors to consider and solve the numerous gender-based problems. It interrogates the pre-conceived expectations about the roles that men and women should have in life. In literary text, feminism brings to scrutiny the representations of gender roles, which tend to enforce social norms, customs, conventions, laws and expectations on the grounds of gender bias. Shanichari has always resisted the unfairness meted out to her. Toughened by the harsh realities, she can hardly shed a tear, let alone cry. Females are not required to be educated by the guideline which is adopted for men. Women have but one resource, home. The end and aim of her life is to nurture the domestic affections, to care for, to comfort, and exercise her little supervision over household economies. These insights of women’s liberation and autonomy are deeply ingrained in the Indian women’s circumstances within the socio-cultural and economic spaces and archetypes of the country. These rituals thus uncover the cockeyed gender equations with the women of the lower caste and class consented to serve as rudaalis. On the other hand, aristocratic women, who are kept sheltered, cannot express their sorrow in public, inhibited by their social ranking. That women and not men are chosen to be mourners also exposes the gender inequalities operating within a casteist and class society. Lamentation is gendered and women become the role bearers. Kalpana Lajmi‘s movie Rudaali is an adaptation of Mahasweta Devi‘s short story, Rudaali. Published in English in 1997, Devi’s short story explains the plight of Sanichari, a woman whose suffering and personal loss informs her work as a professional mourner. Devi offers a emotional account of how this job allows Sanichari to gain a degree of independence and control over her life. Rudaali, the sorrowful tale of womenfolk fated to be funeral-goers, outlines the picture of a habit practiced by the aristocratic families of landlords and noble men, of hiring rudaalis (female mourners) to grieve over the death of their family members. Rudaalis belonging to the lower castes and classes are convened on these circumstances, for the upper classes never openly convey their grief. Agency and autonomy are always endorsed within specific structures of constraints. The relevant point is that organizations thereby do get redefined. Dressed in black with frazzled hair, the rudaalis shed tears copiously, bemoaning over the dead by dancing sporadically and raucously admiring the deceased. Rudaali is a modern woman who fulfills her individual dreams instead of matrimonial contentment. Rudaali is a determined woman who is over-ridden by individuality and her own well-being. The movie is undeniably a subtle satire on the brutal practices that find expression within the diverse life cycle rituals, be it even the obsequies. These outmoded traditions are the offshoots of a dismembered society, where rituals are cultural power resources. The custom of employing fake mourners, known as moirologists, begins from the Middle East and China. Professional mourning or paid mourning is a regularly historical occupation practiced in Mediterranean and Near Eastern cultures, and many other parts of the world. Professional mourners, also called moirologists are remunerated to grieve or provide an eulogy. Notes: Rudaali (1992) was directed by Kalpana Lajmi and produced by the National Film Development Corporation of India & Doordarshan, the Indian public service broadcaster. Rudali is based on a story by the Bengali fiction writer and social activist Mahasweta Devi. 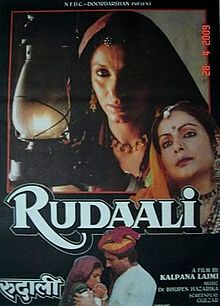 Dimple Kapadia, Raakhee, Raj Babbar, Amjad Khan star in Rudaali.